We previously mentioned that the European version of the Samsung Galaxy S5 has started receiving the Android 5.0 Lollipop update, and if this recent rumour proves to be true, a global roll out is imminent. 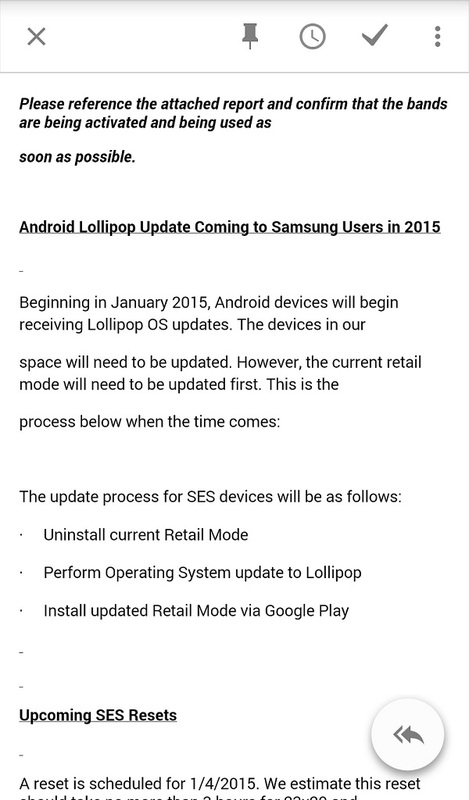 According to the rumour, the Lollipop update will be hitting the Galaxy S5, Galaxy S4, Galaxy Note 4, Galaxy Note Edge, Galaxy Note 3, and Samsung tablets as early as January 2015. A user on Reddit who claims to be an employee of Samsung has shared an internal email that has details pertaining to the Android Lollipop update for the previously mentioned smartphones. According to the email, the Galaxy S5 is set to receive the update first, followed by the Note 4 and Note Edge. The Galaxy S4 and Note 3 will then follow suit, and at the end of the list are the Samsung tablets. No details were given as to which tablet will be getting the update, but we can safely assume it’ll be hitting the Samsung Galaxy Tab S first, which is the company’s 2014 flagship tablet. Unfortunately, the email did not mention if these smartphones are getting the Android 5.0 or 5.0.1 Lollipop update. If we were to take a guess, we’d say it’s the 5.0.1 Lollipop update seeing as how the Note 4 and Note Edge will skip the 5.0 update entirely. Come January 2015, we’d just have to see if this proves to be more than just a rumour. 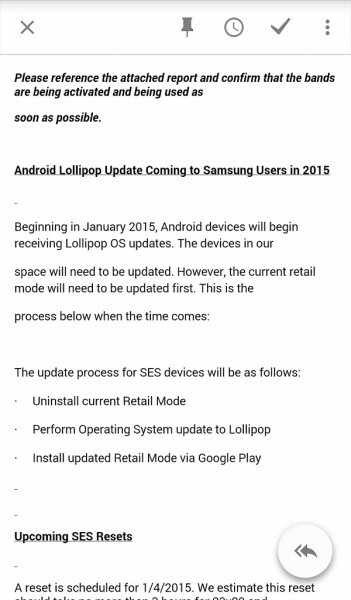 If Samsung does deliver the Android 5.0 Lollipop update next month, it would be one of the company’s fastest update.